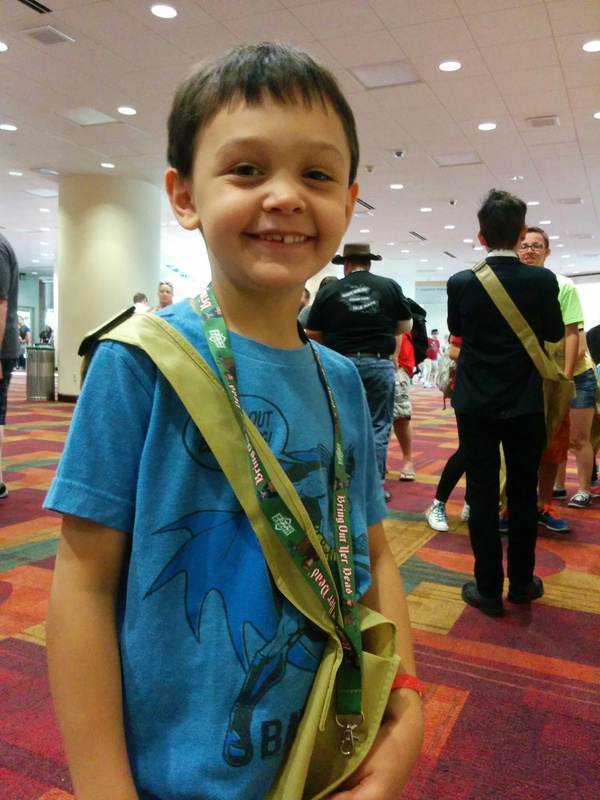 Sunday at GenCon is Family Day. Sunday is also the day I’ve been bringing my oldest son with me for the last few years. 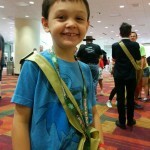 On the drive down Sunday morning I asked him what he wanted to do at GenCon and his reply was: eat at a food truck, collect buttons, and say hi to Todd. I knew he really enjoyed the button hunt that we did last year for the first time, but I hadn’t realized how big an impression the food trucks had made. I guess for a six year old, getting food out of a truck and sitting on the sidewalk to eat is a pretty cool experience. 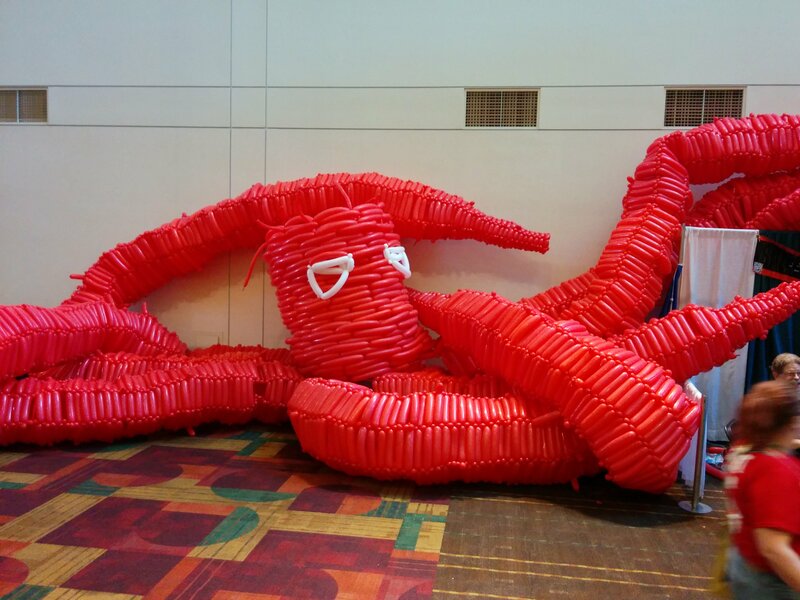 The new thing we did this year was watch and participate in the destruction of the balloon monster. This year it was a Kraken. These are made and then an auction is held to pick a winner to destroy them at noon on Sunday. This year they did something a little different by holding an auction just to destroy the head and they let all of the kids assembled take on the arms. I have some video of this that’s just insane to see, I hope to get it posted later this week. There were a few dozen kids turned loose and going feral. Balloons were popping so fast that it sounded like the end of a fireworks show. The most surprising thing to me that Thing 1 enjoyed was a World War 2 tank game. 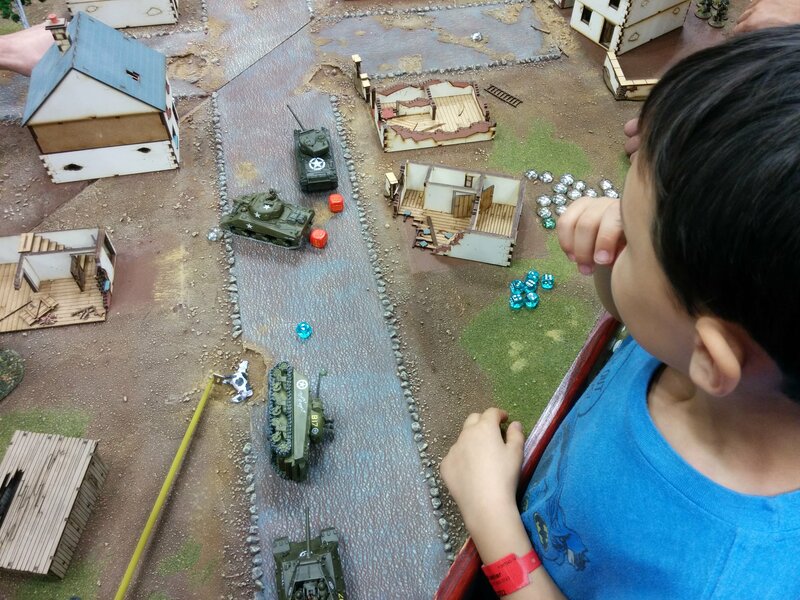 This was near the end of our day and usually by then he’s tire and beginning to have trouble focusing, yet we stood for nearly ten minutes watching other people demo this game. Then he actually sat down and played through a demo himself for nearly fifteen minutes. I was amazed, to say the least. The guy doing the demo recommended that I check out Brikwars which is a set of miniatures combat rules for use with Lego. That’s it for my GenCon recaps, now I have to actually come up with topics for the rest of the month. As always go check out the Blaugust Initiate Page if you’re interested in joining in.